I am a well known sucker for celebrity fragrances, I know most people stick to the classics like Chanel or Dior, but price and packaging wise I like to keep it affordable but quirky. The Katy Perry range is no exception - I fell in love with the Killer Queen fragrance late last year and since then I have been eager to try her third perfume from the Killer Queen range which is called Royal Revolution. This perfume is actually the third collaboration that Katy has done with Coty and it is available in a 50ml and a 100ml bottle. I finally got my hands on the 100ml from Boots. 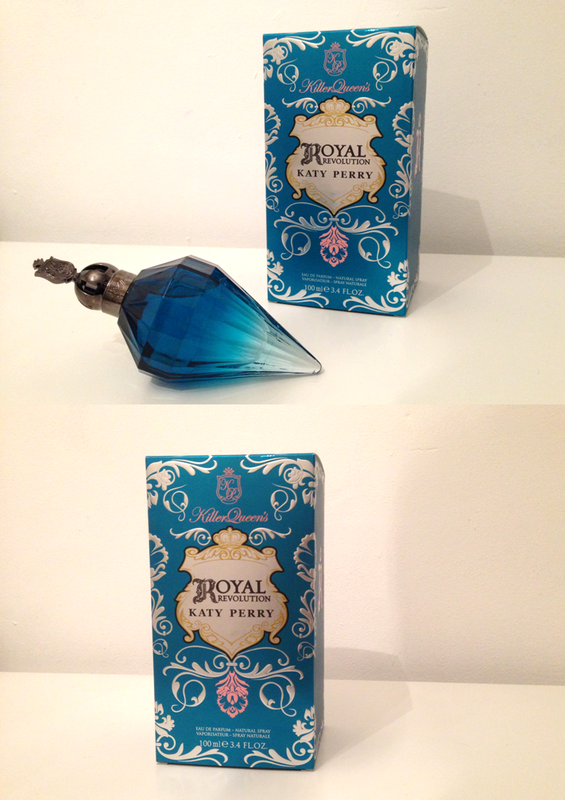 So, let's start with the overall packaging and design of the Katy Perry Royal Revolution perfume - is it practical? Um, no not exactly - I did originally think the perfume would stand up but it just lays on its side, this is the only thing I dislike about the Katy Perry Killer Queen perfumes. For the design, visually I think the bottle is gorgeous. It really looks amazing on my dressing table (even if it is on its side) and I love the colour of the bottle - I personally prefer the blue bottle than the red just because it's quite a unique blue. I love Katy - and I love this perfume as well. It smells great and the bottle is beautiful.